I vividly remember my first comic book. It was the summer of 1981 and our family’s cross-country road trip. I’m pretty sure there was a gasp – and maybe a bit of scream – as I got to the big reveal at the end of the comic version of The Empire Strikes Back, as I had not yet seen the movie. That moment hooked 8-year-old me on this medium. Every pit-stop after that I was picking up an Archie or a Casper. For the next four years, that was my go-to purchase. Any trip to a store would have me coming home with a comic, branching out from Archie to Wonder Woman and Justice League (two shows I watched religiously so why not read the comics too?). Then the peer pressure of the tween years hit. Comics weren’t cool in the mid/late 80’s. Only nerds and men living in their parent’s basement read them. And girls that wanted to be in the right cliques would never be seen in the comics aisle of the bookstore. This was the era of John Hughes & Molly Ringwald, after all. Flash forward 30 years, and here I am in a quiet little rural town with dyed blue hair, owner of a “geek shop” spreading my love of the medium and its stories to new generations. I see girls, women and men of all ages embracing the great storytelling in diverse comics, such as Ms. Marvel, The Unbeatable Squirrel Girl, Faith, Rat Queens, and of course the mainstays of the Marvel and DC franchises. And with the resurgence of Wonder Woman (thank you Patty Jenkins and Gal Gadot), I only see more women and girls finding their love of this medium in the coming years. I myself rediscovered my love a few years ago when someone handed me a Ms. Marvel. I embraced the diversity of the story and fell in love with a non-traditional hero – something that is appealing more and more to the women starting their own journey into the world of comics. Girls have always read comics. There is no denying that fact. But I believe in recent years we’ve seen a societal shift to bring comics into the mainstream, making them far more accessible to women and girls like myself, who in the past may have felt the pressures to conform and not be a “nerd.” Today, comic characters are everywhere, making them and their stories known to a much wider audience than five, 10, 20 years ago. In the shop, we’re seeing much more recognition of characters that the general populous probably never heard of before the Marvel and DC movie franchises exploded. Among our best-selling titles this past winter was Ta-Nehisi Coates’ Black Panther series. A character that two years ago would have sat on the shelf unloved, is now widely recognized and given new life under a brilliant writer. Ms. Marvel is a continual bestseller for us and opens up discussion with customers who are looking for that diverse reading material, especially girls and women looking for stories that better reflect their lives. In September of 2015, the website Graphic Policy did an unscientific look at Facebook likes for the term “comic books” and found that of the 41 million, 43% identified as female. 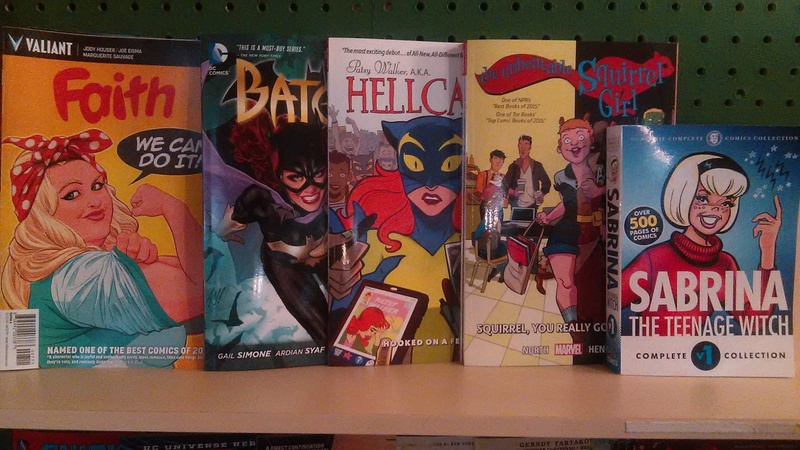 But there is little hard data available about gender buying of comics, or use of libraries for the trade editions. In 2013, Comixology reported that 20% of their new buyers were women, up from 5% in 2009. While the number is outdated and only reflects new buyers, that’s quadruple over four years. Much like in other media industries, anecdotal evidence is easier to find than hard numbers, but one expects the numbers in 2017 are still growing. I am not saying that the stereotype of women not reading comics is gone. We still see it, even among comic book sellers. 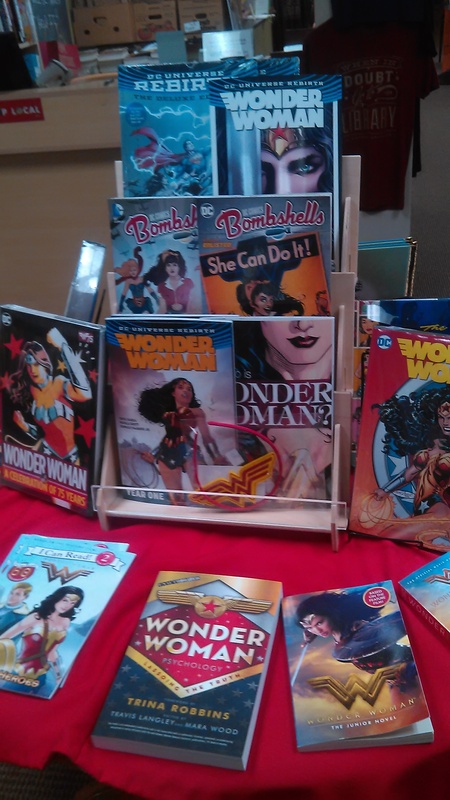 In the aisle of a recent local comic con between two booths of comic sellers, our family heard two very different conversations, illuminating where women are in the comics world. The first conversation was led by a seller passionate and knowledgeable about his product, describing the comics on display, which in this case were all “first appearances” by now iconic female characters: Captain Marvel, Peggy Carter, Spider Gwen, etc. The second conversation featured a seller who sees breasts, not readers. A young woman is looking through the boxes on his table. He tries to engage her, but she says she’s not really a comic book reader. His sales line to her is “Well, do you have a boyfriend you can get one for? You’re pretty enough, I bet you do.” (I know, it took all I had not to go over and immediately intervene.) Not only was the comment offensive, it showed that the dealer had no interest in helping a woman become a comic reader. Thank goodness Conversation #2 was the anomaly that weekend. The shoppers I see in my store and the comic shops I myself patronize at are multigenerational families: men, women and children with varying levels of interest in comics or geek culture. I often see fathers and daughters shopping in our comics/graphic novels section together… and it’s the daughter telling the father about the comics on the shelf – a wonderful sight for this middle-aged comic reader that hid her love of the medium for more than 20 years. I’m pleased to report that I hear very little “mansplaining,” and our diverse and feminist collection is generally embraced. I would even dare to say that the men, women, and children coming into that area of the store are happy to see a non-stereotypical comic seller engaging them in conversations, and sharing her new favorites. That’s not to say we’ve made it. There are still those like the comic seller above in Conversation #2. Men still dominate as the creators of comics. But women are making strides as creators and consumers. We are in a golden age of “geek culture.” Doctor Who is back on TV. Marvel and DC are filling movie theatres. Star Wars is everywhere. And women are a key demographic being targeted. Finally. We as women in the geek community are making our voices heard. And this summer they are being heard loudly as Wonder Woman dominates the box office. There are multiple women nominees in every Eisner category (the “Oscars” of comics and graphic novels). A new Star Trek series is coming with a female lead. We are moving forward in showing that women do read comics, do embrace and engage in “geek culture.” While these are huge strides, we still have work to do. We need to show the comic companies that women do have buying power, that we want more women creators. Visit your local comic shop, ask for their recommendations, buy the titles that speak to you. Then return and repeat the process… often.